Plus 82 Gogi, tucked away in a warehouse space along Eliza Street, is set to become one of Adelaide’s most popular Korean Barbeque hot spots. 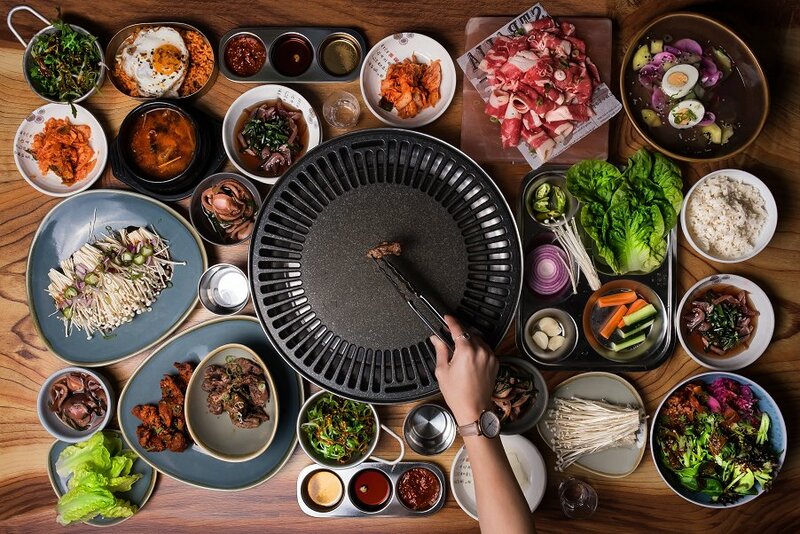 Formerly, Mama Jambo, the restaurant group behind +82 Pocha, Mimi and +82 Lite have now taken over, creating an all-popular Korean BBQ restaurant; introducing authentic flavours to the city. With a wall mural, a celling of traditional umbrellas and Korean music guests are immersed into the Korean culture with a modern twist, while the warehouse aesthetic brings in the BBQ theme of the restaurant. The friendly staff would yell out greetings in Korean to guests as they enter the store, as if they were welcoming customers into their own homes; a wonderful way to bring cheer to the restaurant. The staff would also assist guests with choosing what to eat and the traditional ways of eating the food when it arrived on the table. “‘+82’ is the international dialling code for south Korea. We want to be the ‘connection’ to everyone who wants to know more about Korean BBQ and the culture”. We chose to heed the staff’s suggestion by choosing a sharing option as part of our connective experience. We ended up choosing Set B, which comes with Beef Brisket, Marinated Beef Ribs and Spicy Pork. We also chose to try all the sides of Shake Shake Rice, SSam Plate, Kimchi, Pickled Radish, Oriental Salad and Enoki Mushrooms, to accompany our delicious meats. The Beef Brisket was cut into beautifully thin slices that held a deep flavour and kept us wanting more. The meat was not marinated, allowing for it’s original rich flavours to shine through, showing what a good piece of meat can taste like on its own. This lovely meat selection was our favourite of the night. The Spicy Pork meat had a lovely slight spice to the lovely juicy marinade. Even though they were small pieces of meat, they held lots of flavour. The Marinated Beef Ribs had deep earthy flavours, while the slightly sweeter marinade held lots of flavour that complimented the natural flavours of the beef. With the meat we were also given a selection of sauces: Salt and Sesame Oil, Light Soy with mustard, and a traditional Korean sauce with a soy bean and chilli paste base. 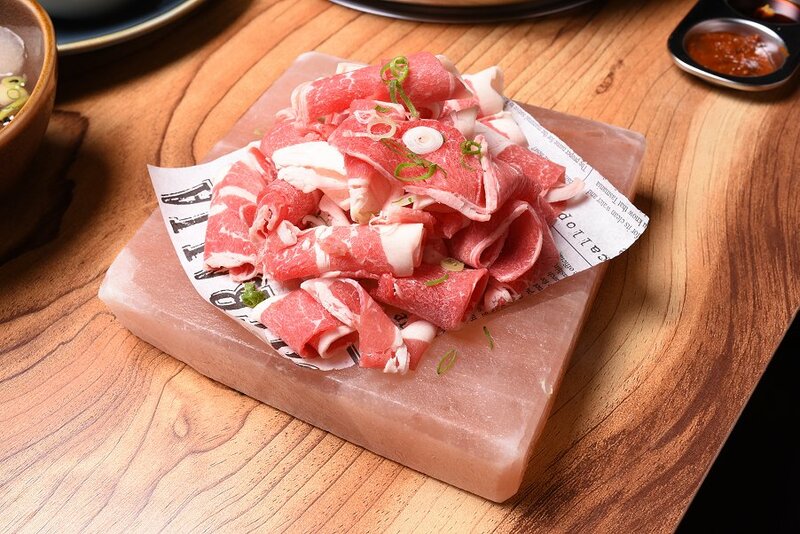 It was recommended by the lovely staff that the fresh meat should be paired with the salt and sesame oil blend, while the marinated meats were best served with the traditional Korean sauce. And they were right, of course, with each sauce complementing the flavours of the meat and never overpowering it. 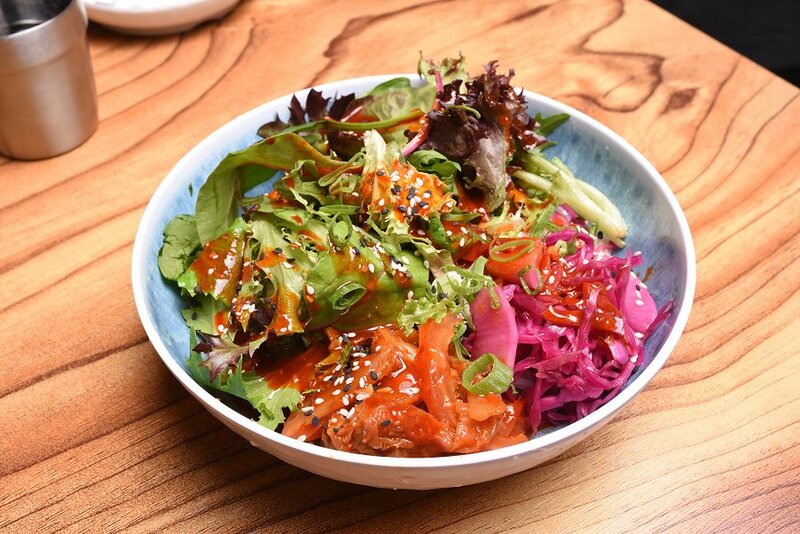 The Sides of pickled onion, radish, kimchi and the oriental salad were full of flavour. The Pickles had a lovely, almost sour tang that wasn’t too overpowering and complimented the meat nicely. The Kimchi and the Oriental Salad held a lovely heat to them from the chilli sauce, which left a nice warm sensation on the tongue. These were best mixed with the meat and the rice to enhance the flavours. The Ssam Plate was a mixed vegetable platter with mushrooms, onion, garlic, chilli, carrot and lettuce. 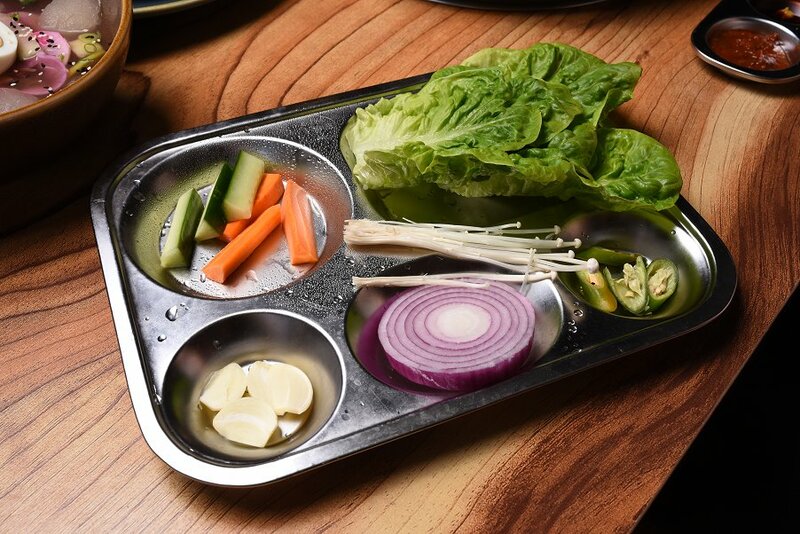 We fried the onion and garlic on the hot plate to add more flavour to our cooking meat, while we used the lettuce, in the traditional way, as a wrap, folding up the meat inside with some of the delicious sides and ate it altogether in one bite. The chef also cooked up our Enoki mushrooms for us in a beautiful sweet sauce with spices that danced on the tongue. The Shake Shake Rice is an old style fried rice with egg. Served in a container, we were told to cook up some meat and vegetables to mix into our fried rice by putting it all into a container and shaking it all up. This enhances the flavours, giving you a delicious rice based dish, all the while adding some fun into preparing the meal. 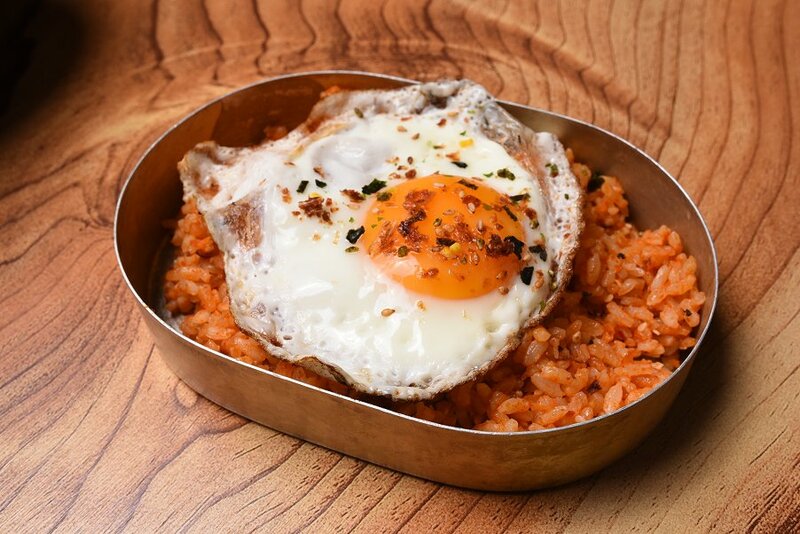 There was a slight warmth from the spices included, but the rice was wonderfully cooked and helped balance the spiciness, while the egg lifted the heat and was a lovely savoury balance. We also decided to try their cold noodle options: Cold Noodles in Broth and Spicy Cold Noodles. Both dishes were delicious and were a lovely cool and refreshing balance to the heavy savoury flavours we had been eating. The cold noodles in broth were paired with lovely light pickles that sweetened the taste buds, while the noodles were nice and soft, creating a lovely texture balance with the lovely crunch of the accompanying vegetables. The Spicy cold noodles was balanced well, the coolness from the noodles pairing with the heat from the spicy chilli sauce that coated the dish. I made sure to mix the sauce into the whole dish so I could get a nice kick with every bite. The Soy-bean Stew was a lovely dish we added to our tasting. The spicy but smooth broth held beautiful punching flavours. The soft tofu was earthy but not too strong, and had soaked up the wonderful spices from the broth, while the vegetables complimented and helped lighten and balance the flavours. We were also offered Korean melon bar ice creams for dessert as part of the set, which were lovely and sweet, perfect after a hot BBQ meal. From the fast and friendly service alone we knew we would have a lovely evening even before the food arrived; with the meals only making the experience that much better. Plus 82 Gogi gives an exciting experience for guests to be able to enjoy themselves, eat delicious and traditional food, all while learning about Korean culture, without having to jet across the world to do so. The whole evening was full of delicious flavours, colours and aromas and we left feeling very full and satisfied. Plus 82 Gogi not only feeds guest delicious food, but also leaves them wanting to know more about Korean culture. So if you want to know more about Korea but don’t have the budget for travel, or even if you just want to try Korean BBQ, make sure Plus 82 Gogi is on your list of places to visit.